It has taken me half my life to associate food with love. For many years, especially when I was a young, single, working woman, food was fuel consumed with a large dash of guilt, and I closely monitored my intake. But recently, I’ve realized that morsels of edible love have been coming my way for a long time—most of them prepared by the men in my life. It started with my dad, who would cut my peanut butter and jelly sandwiches into four precise pieces. “Triangles or squares?” he would ask. My relationship with my father was a rocky one and I often found him difficult to be around. But whenever I envision those tender triangles of grape jelly and creamy peanut butter layered between two slices of Pepperidge Farm white bread, the negative feelings fade away, and I feel cossetted and adored. These days, that message of love, folded into a heaping cup of caring, is delivered with more subtlety via elaborate meals cooked by those same boys, now fully launched adults. Shakshuka—a spicy mélange of vegetables, feta cheese, and eggs—and crusty homemade pizza are among their specialties. They absorbed this technique from my husband, who has also delivered a steady stream of edible love notes throughout our long marriage. There have been more pots of chicken soup to cure a cold than I can count, and for much of our time together — especially after the boys arrived — he has taken on what I once viewed as the daily drudgery of putting a meal on the table. At first, cooking was a novelty. A rich minestrone soup or homemade brownies were a way to impress boyfriends, and, I naively thought, get them to take me seriously. But once I’d hooked my man via quiche and a curried mushroom soup, the novelty wore off when we became ensconced in family life. It was no longer fun to deal with food through the nausea of pregnancy and later through the film of fatigue and time pressure that came with combining work and kids. But lately, there’s been a shift. I no longer get defensive if I don’t have an answer when asked, “What’s for dinner?” (What kind of wife/mother was I that I didn’t have a week of menus at the ready?) Now that we both work from home and it’s usually just the two of us, I look forward to the discussion — and even manage to plan a few meals in advance. Homemade pizza and shakshuka are on regular rotation. They are my favorite meals, because when my husband and I are kneading dough, or chopping herbs and feta, it’s as though our sons are here too. I’m surrounded by my men, cossetted and adored all over again. 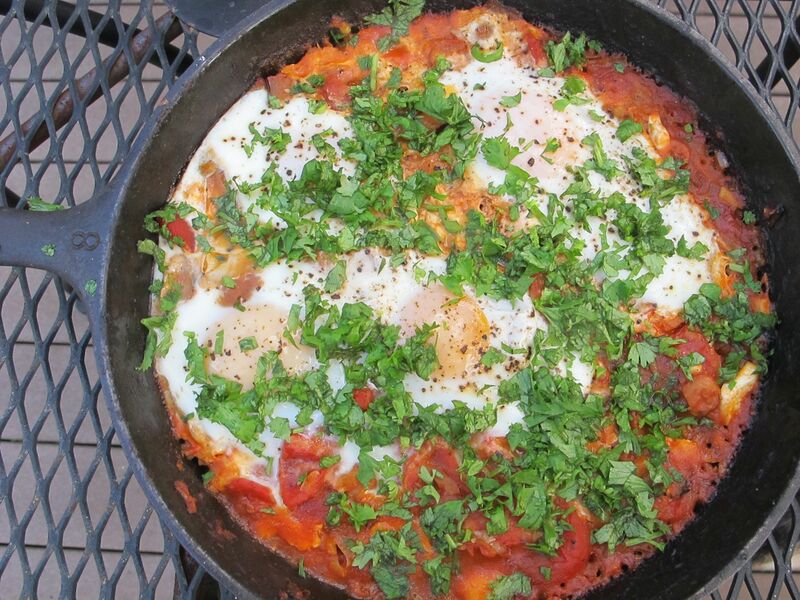 The first time I ate shakshuka was in my older son’s Brooklyn apartment. He moved around his compact kitchen with ease, chopping and tossing ingredients into the pan like a pro. Watching him do all the work was incredibly relaxing. It was the best breakfast I’d had in a long time. Later, he sent me the recipe, which came from the New York Times. 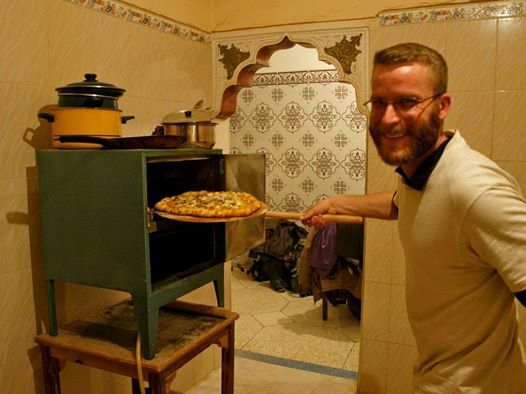 Younger son is a Peace Corps volunteer in Morocco, where all baking takes place over a gas flame inside a blue box. Oven temperature is gauged by eye. Pizza is not readily available there, and he often makes it when other Peace Corps volunteers arrive at his door. Recently, he sent us this recipe for New York Style pizza. The dough is best, he says, when it’s left to rise in the refrigerator for three days. This post is part of a series on Food and Love over at Daily Plate of Crazy. I know how you feel. Scott and our son Johnny are the best cooks in the family. During the last 3.5 months when I’ve had limited use of my right forearm and hand due to an injury, Scott has cooked all (instead of 3/4) of our meals, and I’ve felt a lot of love. Shakshuka has been my favorite ever since our Israeli neighbors served it as the main course of a brunch they made for our family…so good! Nice to see the photograph of your son cooking in Morocco. Is he returning to New England when he finishes with the Peace Corps (late this Spring, right?)? Hello to all in your family, including Karine! And hello to yours as well, Leslie! Yes he will be home in just a few months. There are many in Morocco who I know will miss him almost as much as I have. Good tip re: the pizza dough! Looking forward to having some of that pizza made by the Pizza King in just a few months. Nothing I make will ever taste as good. It used to bother me when my little boy said, “What’s for dinner?” day after day because I felt I was about to get an argument about it. So for a while there I felt better putting a written menu up on the fridge. Thank you so much for this essay, Judith. I love it.